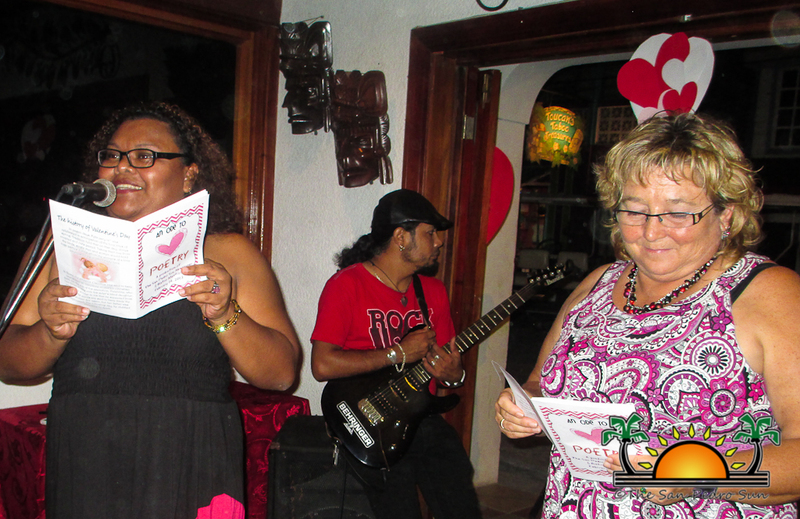 It was a gorgeous night for romance, dining and poetry at Bistro Mestizo, where The San Pedro Sun’s annual Valentine’s Poetry Reading was held. 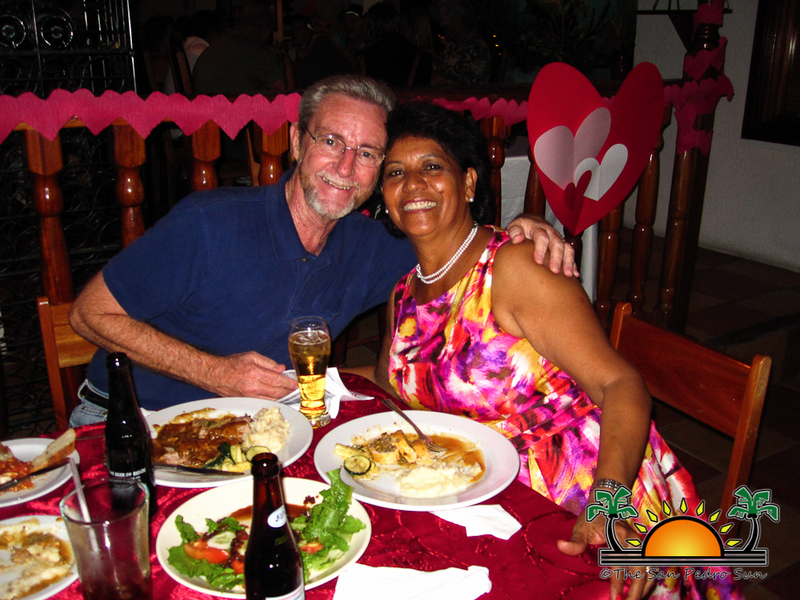 With Valentino on the microphone crooning away love songs, diners were treated to a delicious dinner whipped up with extra love by Miss Shelly and Monica. 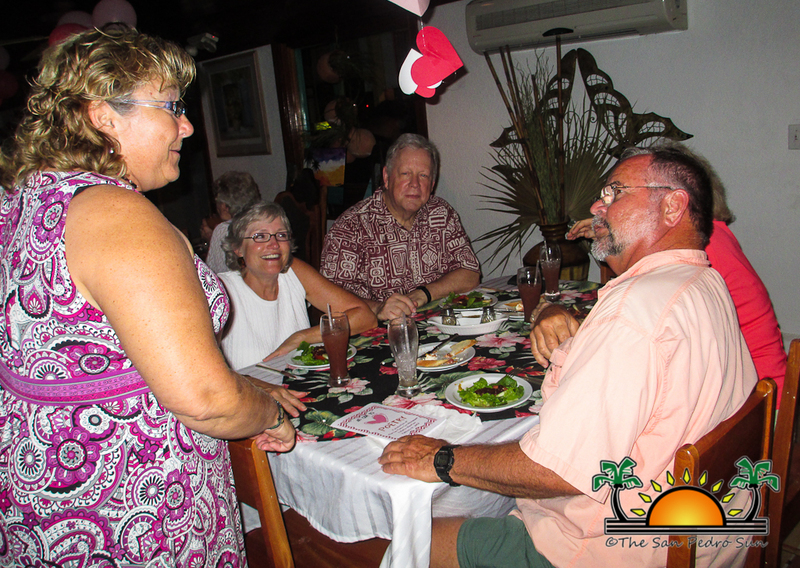 Between bites of sausage stuffed chicken breasts or herb crusted rib roast, patrons sipped on sangria, wine and other mixers as poems were read out loud throughout the night. After a mini-hiatus, The San Pedro Sun was back out in full force, conducting a reading of the various poems submitted for judging. From the short, sweet and funny, to sonnets dedicated to gorgeous San Pedranas (and no, we’re not talking just lobsters! ), and the requisite romantic Spanish verses – there was something to intrigue everyone. At the end of the night, there were more than a few suggestions on who the winners should be. The final decision was difficult, but in the end, we can present to you, our readers, those who have taken the prizes: Grand Prize: “Our Madonna” by Bradley Haylock, Most Romantic: “For Monique” (on our 60th wedding anniversary) by Jay Frankston, Ode to the Lobster: “Lobster Sonnet” by Tom Taylor, Spanish Language: Miss Blanco “El amor unico de la vida nunca se olvida”, and Funniest: “Birds and the Bees of Caribbean Seas” by Tom Taylor. Since the poems were so fantastic, we had to divvy up a few honorable mentions, and this year, those prizes go to: “Try a Little Kindness” by Linsford Garbutt, and “You” by Aleida Perez. Winners may pick up their prizes, which have been oh-so-generously donated by various business sponsors, starting Friday, February 22, 2013. Congratulations writers – we have truly enjoyed reading your fabulous entries, and encourage you to continue writing. Who knows, you may take the grand prize next year! The San Pedro Sun thanks Bistro Mestizo for hosting our event this year, and once again, we congratulate owner Shelly and her husband Dave Huber on their 17th anniversary! Thank you for sharing your special evening with us. With an ardent, flowing day-glow. She is fresh air all around. Her feet don’t touch the ground. Say a prayer and She will find you. Think of love and She is behind you. I prayed to my God; please. I felt Her hand upon my heart. Gave my life a real jump-start. Sing a song and She will find you. Say a prayer and she is behind you. Can fill my soul with every need. She can make my every day. She enjoys the love I have to pray. Shine a light and She will find you. Speak to God and She is behind you. of his long and healthy life. to keep my body in shape, and I did. That I kept my temper tucked away in my sleeve. and never broke pace with my heart. That it was fresh air, hard work, and clean living. But that’s not it” he said. and led his frail body into a jig. “I had nothing to do with it. warm and comforting on cold winter days. into the fertile soil in which I am the seed. but in truth I had nothing to do with it. I was just lucky. That’s all! Of all creatures in the sea, lobster is the best. Sent from Heaven, lobster’s better than the rest. Wake up early, board the boat and raise a sail. Find the lobster honey holes circled on the map. Gather all pots, and set some bait out in the trap. Serve lobster anyway you like, soft or hard-sheller. One taste, and fall in love with this bottom dweller. So long as we’re bringing home a lobster in the pail. Te confese los miedos que tenia. Me comprendiste y me enamoraste. Que mas que amigos nosotros terminariamos. Con un Corazon verdadero y carinioso. proque en tiempos malos contigo quedaria. Que haria si te irias? Entonces el tiempo rompera la pared que te aleja de mi. Siempre sonreimos juntos como locos. Sera para siempre, sera real este amor que encontramos? El tiempo revelara lo que en el futuro se espera y sientes por ti. Lo que e dicho no es pasajera. Conosiendote a cambiado mi vida. Planned to live a life of ease. Warmed by the sun and a tropical breeze. Sunday morning I'd eat ribs with folks at BC's. Friends in the states were sick with jealousy. Til the blackout came, and there were no batteries. Where politicians run the utilities. Next day, hobbled to the clinic at Dr. T's. But here in Paradise, there are no facilities. Don't know why I gave one of them my golf cart keys. Finally found her, and demanded, "Cart keys pleaae?" She said, "I left it up north cause the engine seize." And long for our temperatures of 80 degrees. Sick of those colds where you cough and sneeze? A few facts you need to know before moving overseas. Here in Paradise, there are no guarantees. Life is not a series of afternoon teas. Cause you're gonna need it if you move to Belize! But too often they feel lost and dejected. I hope that me and “My Rosita” never end. Am I an expert? Hell no, but it worked for me. Letty Lara Fashion Show – Fun! !